Want something for dinner tonight that is delicious, healthy and only takes 5 minutes to make? 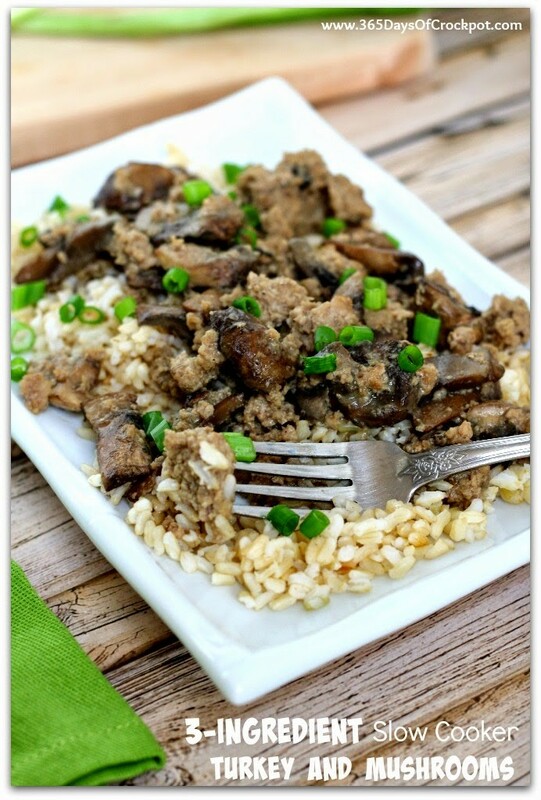 Look no further–this slow cooker turkey and mushrooms dish fits the bill. This recipe was one of those happy accidents that happened. I had some mushrooms in the fridge that needed to be used up. And as I cleaned out my pantry (it was bad, people) I found the homemade gravy mix that I made for this 3 packet roast recipe. I decided to put both into my crockpot along with some ground turkey. The results were awesome. My husband was working from home and he scarfed it down almost before I could snap a few pictures. I was originally going to make it into a stroganoff type meal with cream cheese and sour cream but decided it tasted great as it was. We served ours over brown rice but you could make some egg noodles or mashed potatoes or even serve it as a lettuce wrap if you’re carb conscious. Add ground turkey to the slow cooker and break up theturkey with a spoon. Add in sliced mushrooms, gravy mix and water. Stir with a spoon. Cover and cook on LOW for 3-5 hours or on HIGH for 2-3 hours. Remove lid and break up the turkey with a spoon. Salt and pepper to taste if needed. 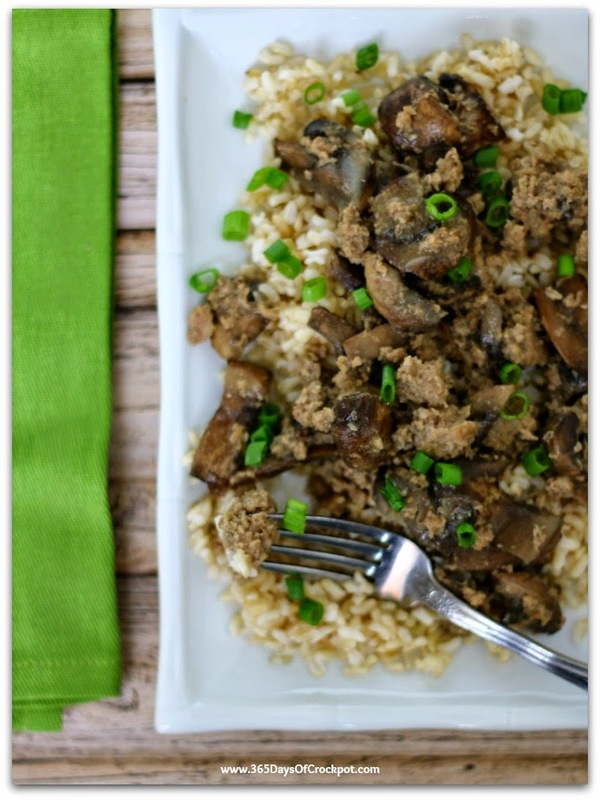 Serve turkey and mushrooms over rice, noodles, potatoes or in lettuce wraps. Garnish with sliced green onions, if desired. Run all the ingredients through a blender or food processor. Pulse about 10 times until all the granules are the same consistency. Store in an airtight container. To make gravy, mix 1/4 cup of mix with 2 cups of milk or water in a saucepan. Whisk over medium heat until smooth and it thickens. Variations: Add in 4 oz cream cheese and 1/2 cup sour cream after the turkey is cooked, for more of a creamy, stroganoff type meal. You can also make this with lean ground beef or ground chicken instead of ground turkey. I absolutely love this recipe but my husband says it is too bland. Any suggestions? salt and pepper to wonders. hot sauce? Can you use gravy packets? If so what flavor? Yes I be that would be great. I would use a chicken or turkey gravy packet. I was sceptical, but tried it anyway. It was quite good. 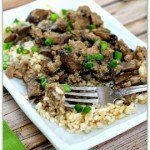 I used baby portabella mushrooms since that’s what I had on hand. Added Greek yogurt at the end, and served over jasmine rice with a Greek salad on the side. No complaints from my husband. Your video is super cute! I have mine in the slowcooker now. I added a chopped up sweet potato, and 1 small leek, just cause I had it. Thanks very much for inspiring my dinner tonight. Ill be back for more recipes. Going to try this. Do you think using baby bella mushrooms instead of white ones work? Of course! It will be great. Has anyone tried this with hamburger? I haven’t but it would work well with lean ground beef. Making this for my mushroom-loving toddler, planning to put in the cream cheese as you suggested to make it a little more calorie-dense for him! Thanks for a lovely recipe! I’m so tired of people and their deceptive food photography!! You know as well as I do that those mushrooms did NOT come out of the slow cooker looking all brown and caramelized like that. In fact, I’m betting it didn’t look anything like that photo. This is a false claim. The mushrooms looked exactly like that when they came out of the slow cooker. Hi! I followed this recipe, and I’m not sure what I did wrong, but it came out with a lot of liquid. Was I supposed to make the gravy and then add it, or just add the dry mix? I thought I was supposed to make the gravy with 2 cups water and then add that, so I imagine that’s what went wrong. Oh I’m sorry Megan. Yes, just the dry mix. I’m making this recipe now and I, too, am not clear on the gravy piece. In the ingredients list it indicates 1/4 cup gravy mix. Below, there are instructions to make the gravy that include adding a 1/4 cup to 2 cups water…..just clarify: I am to only add 1/4 cup of the dry mix to the crockpot – not the liquid that is described? Hi Jada, yes you are right. Just use 1/4 cup of the dry mix. Does the turkey have to be frozen or is it okay if it’s thawed? It can be thawed! It will just take less time to cook. I came across this recipe on Pinterest and I made it for my family tonight. My family and friends includes a husband who rarely compliments my cooking, and 2 little girls age 4 and 6. Everyone loved it! I used an envelope of gravy mix and I served it over quinoa. Thank you so much! Is there a way to convert this recipe to a one pot rice cooker/slow cooker meal. This recipe sounds delicious but since I’m working trying to cut down on steps. I bet you could put rice and then water in the bottom of the slow cooker and add all the rest of the ingredients as well. I haven’t tried it so I can’t be sure. I would use white rice or minute brown rice if I were you because it will cook close to what the turkey takes to cook! I can’t say for sure but you should probably be okay to skip the flour! How does this make enough gravy with just 1/2 cup water? How much would I use with jar gravy? i don't have bouillon granules… do you have an equivalent for the 'better than bouillon' type stuff? Okay so it's 9 cups of broth basically…so whatever better than bouillon says to make 9 cups of broth. Is it a 1 tsp to 1 cup ratio? Does the ground turkey need to be browned first, or can it just go in the slow cooker raw? Can you brown the Turkey first?